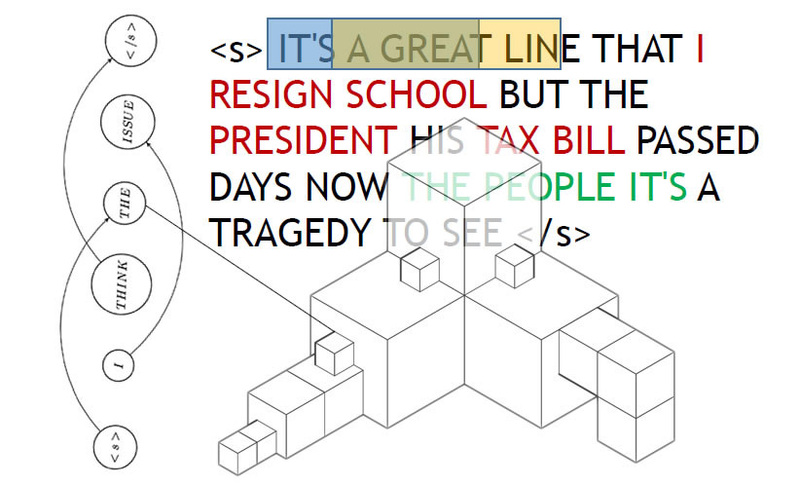 This image incorporaties a fake sentence and parts of the winning team's slides. Two teams of Language Technologies Institute students have won top honors in the annual 11-761/11-661: Language and Statistics course project. Students in the course, which aims to ground the data-driven techniques used in language technologies in sound statistical methodology, must complete a substantial team project at the end of the semester. The project requires students to investigate, discover and exploit deficiencies in the conventional trigram language model using sound statistical methods. To do this, the teams write a program that tries to distinguish real broadcast news articles from fake "articles" generated by a broadcast-news-trained trigram model. The performance of each team's program is judged on both a hard metric — the percent of items correctly classified; and a soft metric — the average log posterior of the correct label. Top honors for the "hard measurement" category went to the team comprising LTI Ph.D. student Joana Correia and MLT students Daniel Clothiaux, Aman Gupta, Elliot Schumacher and Emily Tagtow. MIIS students Yanran Hao, Yulan Huang, Ang Lu and Heqing Ya won the "soft measurement" category. The winners will accept their chocolate truffle prizes at the LTI's graduation celebration on Friday, May 13.